When is the best time of year to trim trees? Does it really matter what time of year you trim or prune your trees? This is a good question and we will answer both of these questions on this page. If you want to trim back small tree branches, lightly shape hedges or conifers or remove diseased or dead branches, these can all be done any time of the year. Most often, the best time to trim tree limbs is during the late winter while the tree is dormant. During the dormant season is ideal because there is less risk of disease or pest infestation. The cut wounds will heal faster in the winter which helps keep the tree strong. Trimming during the winter will also result in a burst of new growth in the spring. If, on the other hand, your goal is to slow the branches you don’t want, direct the growth, or dwarf the development of the tree, trimming should be done after the seasonal growth is complete in the summer. One other point to note is that during the summer, defective limbs can often be seen more easily due to the weight of the leaves on the tree. If your purpose for trimming is to enhance the flowering of a tree, prune spring flowering trees when their flowers fade. For trees and shrubs the bloom in mid to late summer, trim them in winter or early spring. Is there any time of year that you should NOT trim? The answer to that would be yes. Don’t trim or prune your trees in the fall. Fungi spread their spores abundantly in the fall which puts your trees at risk for a disease. Also, the wounds on the tree made from cuts seem to heal slower in the fall. 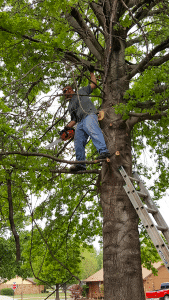 At Kelley Tree Services of Tulsa, we have more than 30 years of experience in all things trees. Our employees are trained and experienced arborists to help ensure you get the best tree services possible. We can handle the largest or smallest jobs professionally and quickly. We service all of Tulsa County and the surrounding areas including Tulsa, Broken Arrow, Sand Springs, Jenks, Bixby, Owasso and Sapulpa. If you don’t see your city listed, still give us a call. We will always do our best to service any tree need you may have. 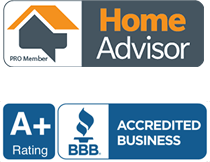 And our A+ Rating with the Better Business Bureau shows how much we love happy customers! Call (918)-288-2873 today for a free quote.